Toxicology Section News—Thank You, Seattle, for a Wonderful 70th Annual Meeting! It is difficult to believe a whole month has already passed since our incredibly successful 2018 Annual Scientific Meeting in Seattle, WA. Our sincerest thanks to all the 2017-2018 Toxicology section officers, chairs, co-chairs, abstract reviewers, moderators, and volunteers for your efforts. We are also grateful for all the financial support we received from our wonderful and generous vendors and sponsors. Great meetings like the one we just completed are impossible without the dedication of so many individuals! The Toxicology Section was inspirationally represented at the Student Academy program by Philip Kemp and Sabra Botch-Jones, who described to local area high school students how forensic toxicology can be crucial in the administration of justice. Our own Nikolas P. Lemos was appointed by AAFS President Betty Layne DesPortes to chair this year’s Academy-wide Plenary Session during which three distinguished speakers presented their views and opinions on why “Science Matters.” They included United States Deputy Attorney General Rod J. Rosenstein, Itiel Dror of the University College London, and Rush D. Holt of the American Association for the Advancement of Science. On Wednesday, we also held our section’s annual luncheon, during which Patrick M. Harding offered a very well-deserved memorial on Kurt M. Dubowski before Robert M. Middleberg and Michael Peat surprised Graham R. Jones as one of our section’s most respected members with an emotional peer-recognition topped with many old photographs capturing his evolving career (and fashion sense). Immediately after the luncheon, we held the Toxicology Section Business Meeting, during which we elected Nikolas P. Lemos as our 2018-2019 Toxicology Section Chair and William (Bill) Johnson as our 2018-2019 Toxicology Section Secretary. Sherri L. Kacinko and Sabra Botch-Jones were appointed as the 2019 Toxicology Section Program Chair and Program Co-Chair, respectively. Our Section is extremely proud of Ruth E. Winecker, who will serve AAFS this year as Vice President and Jeri D. Ropero-Miller,. who will serve this year as Secretary of the Academy. They join Sarah Kerrigan on the Board of Directors, who continues to serve the Academy as Director. During the Business Meeting, we also presented this year’s Toxicology Section awards: Frederick (Fred) W. Fochtman was awarded the Alexander O. Gettler Award; Sarah Kerrigan was awarded the Rolla N. Harger Award; Karl B. Scheidweiler was awarded the Ray Abernethy Award; Erin L. Karschner was awarded the Irving Sunshine Award. Unfortunately, no nominations were received this year for the June K. Jones Scholarship. This year’s scientific program was put together by William Johnson and Sherri Kacinko. It began on Wednesday evening with the presentation of 21 posters on various topics of toxicology. It was a difficult choice, but our section judges selected the poster presentation by Richard A. Gilliland and Anthony P. DeCaprio, entitled “A Mass Spectrometric Approach to the Analysis of Covalent Modifications of Blood Proteins by Drugs of Abuse” as this year’s winner for Best Toxicology Poster. On Thursday morning, our section participated in a multidisciplinary session on “The Synthetic Opioids Epidemic and Forensic Science” featuring platform presentations by speakers from Criminalistics, General, Pathology/Biology, and Toxicology. Sherri Kacinko spoke on behalf of our section. The opioid theme continued on Thursday morning with three additional speakers before our section program switched to “Drugs and Driving” with seven diverse presentations on this subject. On Thursday afternoon, we heard eight platform presentations on “Analytical Methods in Toxicology” before concluding the day with the annual Toxicology Open Forum, which this year was very well-attended and provided for some extremely lively discussions on many topics of interest to both local and international toxicologists. Friday morning began early for our section with a Breakfast Seminar on “The Making of an Opioid Crisis in America? Why Research, Policy and Practice Matter,” chaired by our own Jeri Ropero-Miller. This was followed by platform presentations in the joint Pathology/Biology and Toxicology multidisciplinary session on “Postmortem Forensic Toxicology.” After that, we heard platform presentations on general forensic toxicology topics before concluding this year’s scientific program with our annual “Pediatric Postmortem Toxicology” session that once again strongly encouraged audience participation and feedback. At least two off-site events took place during this year’s annual meeting that involved our section membership: on Sunday, February 18, the National Safety Council presented Marilyn A. Huestis with the 2018 Robert F. Borkenstein Award and on Wednesday evening, the entire Toxicology section membership was treated to an hors d’oeuvres and drinks reception by NMS Labs and the Center for Forensic Science, Research and Education (CFSRE). First, please consider applying for your own membership promotion within the Academy and encourage others to join our section as well by the October 1, 2018, deadline. The names of all Associate Members and Members who apply for promotion within our section at the 2019 annual meeting will once again be entered in a drawing for one free basic annual meeting registration for the 2020 annual meeting scheduled to take place in Anaheim, CA. Also, do you have a distinguished colleague or a deserving graduate student you would like to nominate for one of our section’s awards/scholarships? 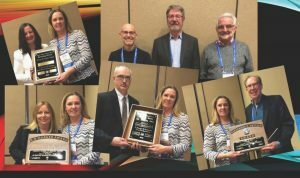 August 1, 2018, is the deadline for nominations for these awards that remain a wonderful way to offer recognition of contributions and dedication to our field. Contact the Chair of the Toxicology Section Awards and Scholarship Committee, Timothy P. Rohrig (trohrig@sedgwick.gov), with your nominations. The August 1st deadline may feel like it’s a long way away, but now is the time to start planning. We encourage you to consider submitting an abstract for platform and/or poster presentation, and/or to propose a half or whole day workshop, and/or a breakfast or luncheon seminar! How about serving our section as an abstract reviewer, judge, or moderator? Toxicology Section Program Chair Sherri Kacinko is assessing everyone’s willingness to assist with the program – please take a few moments to complete this online survey to let her know how you would like to be involved: https://tinyurl.com/AAFS-TOX-2019. And, of course, please contact Toxicology Section Program Chair Sherri Kacinko (sherri.kacinko@nmslabs.com) or Toxicology Section Program Co-Chair Sabra Botch-Jones (sabraj@bu.edu) with any other suggestions or program ideas. Mark your calendars now for the AAFS 71st Annual Scientific Meeting, February 18-23, 2019, in Baltimore, MD, the birthplace of the American National Anthem penned by Francis Scott Key.